IFT volunteers are at the core of what our organization does. Without the dedicated work of volunteers, our mission of advancing the science of food would not be possible. 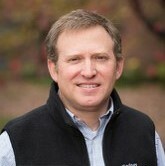 R&D Food Scientist, BlendTech Inc.
IFT: What has your experience been like as a volunteer with IFT? MT: My experience at IFT has been phenomenal. In college, I wasn’t nearly as involved (with IFT). But then, when I graduated, I was lucky to join a company that really saw the benefit and value in IFT, and they have encouraged me to get involved in any way I can. I started out with some involvement with the Oklahoma section. I eventually became the secretary, and I am now Chair Designate, meaning this coming year I will be chair of the Oklahoma section. I have continued my involvement as a member of the New Professional Work Group, and it has been excellent. Everyone within IFT is always super helpful. They are so dedicated to this industry, and to helping the new minds who are in it, and to educating people who aren’t within it on how it works. All of my involvement with IFT has been excellent. IFT: What do you feel like you have gotten from being a volunteer with IFT? MT: For me, it has really been an opportunity to build a community. And that’s more than just building a network. It’s almost like a community tribe—I feel like I’m a part of something biggest than myself. It makes me feel like I have a place to make a difference, and to build myself. And on top of that, the networking portion is really good. I have lots of new professional contacts, and that’s everyone from mentors to people I can reach out to with business or product questions. And so there have been tons of benefits. IFT: What do you see as some of the value of new professionals getting involved with IFT? When I was in college, I was surrounded by like-minded people who were also within food science, and connections were very readily available. But after starting my career, it was basically the people at my organization, and that’s it. As a new professional, (volunteering with IFT) has helped me really branch out and meet new people. It’s helped me make connections that I otherwise would not have had. I have been able to connect with people in other areas of the industry—people in government, people in manufacturing, people in academia. And it has helped me really understand the industry and keep that passion and love of food right where I want it to be. IFT: If someone was thinking of volunteering with IFT, what would you tell them? MT: I would tell them that it is absolutely worth it! There are a ton of people who would love to help you get started. This organization is really good about helping you get involved. And there are so many opportunities out there. Even if you think “I don’t have enough experience, I’m too new,” that is definitely not true. Everyone has a voice. Everyone has a place, and there is definitely room for more. FH: The experience has been outstanding. I like the fact that there are so many levels to engage in volunteering in this professional society—from division member, to symposia organization, to competition judge, to...you name it. These multiple opportunities are positive in terms of the organization itself, and also positive in terms of personal and professional development. It is a true win-win situation. 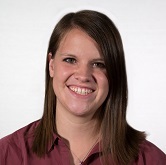 FH: I was able to grow by being exposed to areas that were outside my comfort zone, and I was able to meet unique individuals and establish great connections. The seed ideas for some current research projects came from interactions through IFT volunteering. IFT: As an associate professor, what do you see as some of the value for students who get involved with IFT? Learn to be aware. In a personal level volunteering is a good way to train yourself in the challenges associated to pushing forward a good idea. In a professional level, volunteering exposes you to the current topics and challenges affecting once professional career. Meet interesting people. Establishing connections and getting to meet potential mentors through effective volunteering is a great way to establish a professional path. Learn about yourself. Volunteering allows you to be your own boss and to administrate how much effort you truly put in something that is important but has no grade attached to it. There is no final quiz or exam when volunteering, but there is always a personal evaluation. FH: Jump in! If you did not like the first spot...look again! There are PLENTY of places and opportunities to volunteer. For instance, go to the networking reception and join the leadership of a division. Thank you to all of our amazing volunteers! 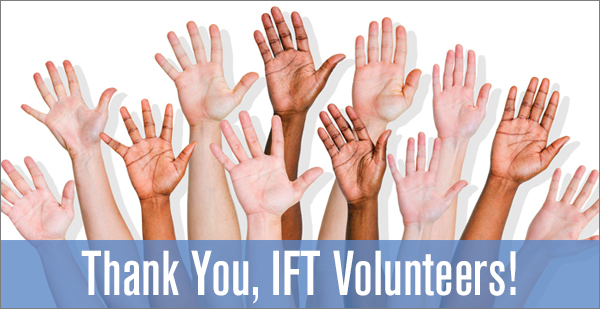 If you are interested in becoming an IFT volunteer, click here to check out the latest opportunities.